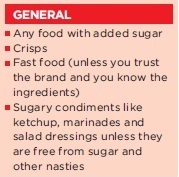 The Banting Really Red List is the most important list of foods you will ever need to know. If you ignore everything else you ever read on this website or in our books, that is totally cool, provided you take note of this. The Banting Diet has nothing to do with adding extra foods into your diet. 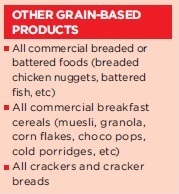 If you are currently overweight or Type 2 Diabetic, don’t buy Banting products. Don’t start eating butter-fried lamb chops with butter sauce. Don’t drink bulletproof coffee. Don’t starve yourself. 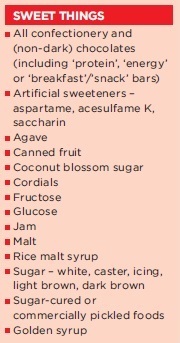 Don’t stock up on artificial sweeteners and almond flour. 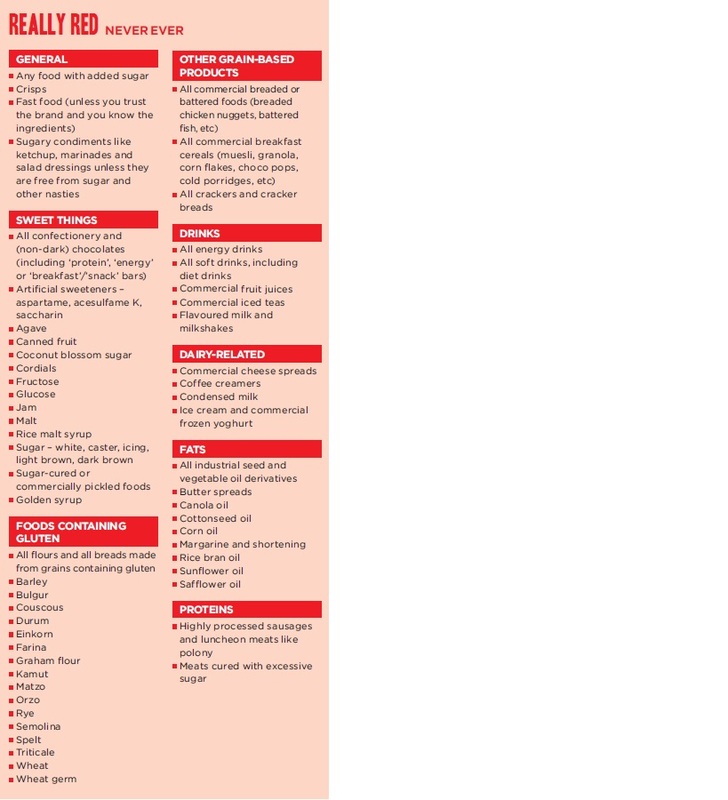 The boldest move you can make to revolutionise your health and your weight, is to immediately cut out every single food on the Banting Really Red List (The Red List). This, and this alone should dramatically improve your health and most likely result in weight loss, better sleep, reduced abdominal discomfort and a few other surprises. Obviously there is more to our program than the above advice. We help you cut certain things, phase by phase, using the Banting Food Lists as a guide (along with full time support), but the most important step in our program is cutting out the Really Red List. Without cutting every one of these foods, you simply will not see results. We would even go as far as to say that you should not eat any foods (low carb, real fats or not) that are pretending to be low carb versions of these foods. To get results that transform your health and your weight, you must totally transform the way you eat. Now, that is quite a lot of food choices to quit on. But don’t freak out. Keep reading for some more info on each category. Probably the greatest food journalist in the world, Michael Pollan, put it so well in this video (and in only one minute and 30 seconds). Apart from the fact that sugar is at the heart of your body’s fat building process, the facts in this quick Ted animation should put you off sweet sugary things forever. This is where things start getting contentious. There are gluten allergies and there is celiac disease. The symptoms of which are well known around the world. But, there is a third condition relating to gluten called non-celiac gluten sensitivity. 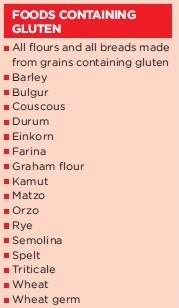 It is unknown how many people have non-celiac gluten sensitivity. What we do know is cutting it out makes a massive difference to more than 90% of our members. This videos summarises the gluten universe in just five minutes. Imagine yourself, 3000 years ago, running across a plain in Africa wearing your loin cloth, and holding a spear or a basket for foraging. You stand up straight and look as far as you can into the distance while you use your hand to shelter your eyes from the hot African sun. To the north, you can see giraffes in the distance stretching to nibble the leaves of the acacias. On the east, there are vultures scavenging at a kill. To the south, you hear lions roar. To the west you can see wildebeest, impala and orynx having a drink at a waterhole. Be honest. Look as hard as you can. Can you see anything from the red list on those plains? There were no pop tarts in the Garden of Eden or the Cradle of Humankind and there shouldn’t be pop tarts at the dinner table today. Please note: Drinking yoghurts, fruit juices, iced teas and energy drinks usually contain the same (often more) sugar than sodas. Much like Michael Pollan’s stance on foods stated in the earlier video, these commercial dairy products can’t be looked at in the same way one would look at a chunk of brie or gorgonzola. Dairy, in its natural state cannot survive outside of a refrigerator for more than a day, let alone a few years like most coffee creamers. Any shelf-stable dairy (apart from maybe UHT milk) should be avoided. 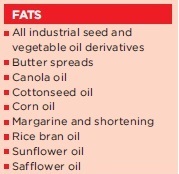 Highly processed vegetable oils are probably the most underrated health threat today. When you were looking out on the plains earlier, did you see an oasis of ‘super healthy’ vegetable oil anywhere? If you’re desperate for one last Vienna, watch this. There you have it. Quit these foods today and watch your health transform right in front of you.